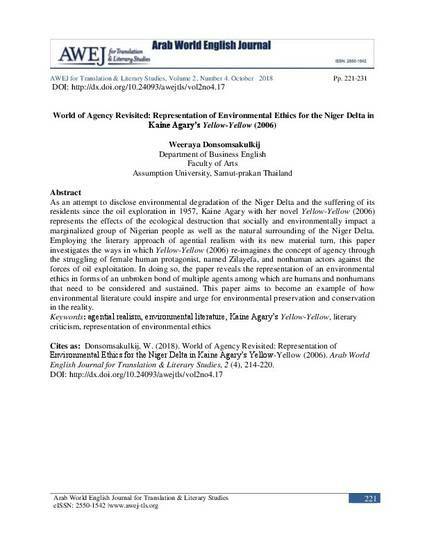 As an attempt to disclose environmental degradation of the Niger Delta and the suffering of its residents since the oil exploration in 1957, Kaine Agary with her novel Yellow-Yellow (2006) represents the effects of the ecological destruction that socially and environmentally impact a marginalized group of Nigerian people as well as the natural surrounding of the Niger Delta. Employing the literary approach of agential realism with its new material turn, this paper investigates the ways in which Yellow-Yellow (2006) re-imagines the concept of agency through the struggling of female human protagonist, named Zilayefa, and nonhuman actors against the forces of oil exploitation.  In doing so, the paper reveals the representation of an environmental ethics in forms of an unbroken bond of multiple agents among which are humans and nonhumans that need to be considered and sustained. This paper aims to become an example of how environmental literature could inspire and urge for environmental preservation and conservation in the reality.